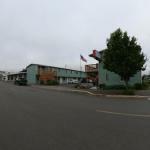 Featuring rooms with free Wi-Fi this Ilwaco Washington motel is across the street from Louis & Clark Discovery Trail. Boat parking is available onsite and sports fishing is accessible from the property. Offering a flat-screen cable TV each room provides free Wi-Fi and an en suite bathroom. Tea and coffee-making facilities are also provided in rooms at Col-Pacific Motel. Fax and photocopying machines are provided at Motel Col-Pacific. Hiking and other outdoor activities are also nearby. Cape Disappointment State Park is 2 miles away from Col-Pacific Motel. Portland International Airport is 115 miles away.